ARLINGTON, TX - APRIL 14: Nick Martinez #22 of the Texas Rangers pitches against the Los Angeles Angels in the top of the first inning at Globe Life Park in Arlington on April 14, 2015 in Arlington, Texas. 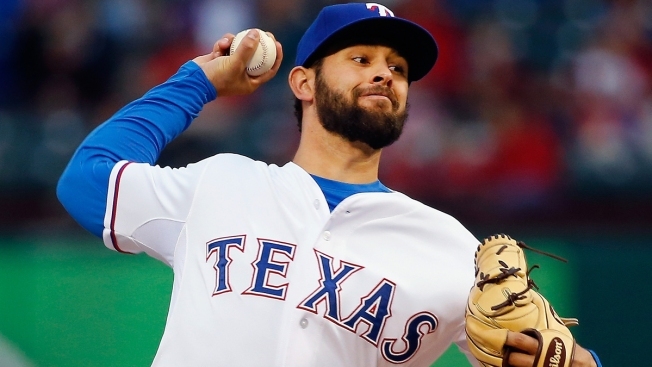 It's possible there hasn't been a more pleasant surprise — other than perhaps Delino DeShields — on this year's Rangers squad than starting pitcher Nick Martinez, who entering spring training was probably seen as about the Rangers' eighth starter. So far this year, he's arguably been the team's ace, and it all came crashing to screeching halt on Wednesday night in his game against the White Sox when he allowed six runs in the second inning and failed to make it out of the fourth to end a franchise record streak of 16 starts, dating back to last year, of allowing three or fewer earned runs. But Wednesday was bad from the get-go. He got through the first inning without issue, but then it seemed he couldn't do anything right in the second, as he allowed two runs apiece on a single, double and homer in the second inning. He was eventually chased in the fourth after two straight walks, as control was an issue for him all night. This was bound to happen eventually. Martinez doesn't have the stuff to be as dominant as he had been for as long as he had been. With that said, his ERA still sits below 3.00, and he's still having a great season. He'll just have to shake off Wednesday's start and regroup for his next outing in Baltimore next week.